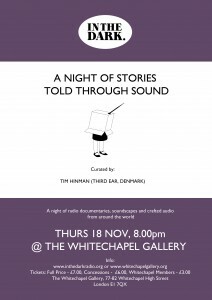 In November Tim Hinman from the brilliant online audio magazine Third Ear will be flying over from Denmark especially for In The Dark and will present a series of audio works from Denmark and beyond. There will be a few foreign language pieces but don’t panic – there will be subtitles! A great opportunity to hear work that would otherwise be impossible for many, from a country that knows a thing or two about how to make great radio. Some great stuff played last night – that final piece was incredible.